does anyone know where the y-valve is for the holding tank on a 1999 41 SCR? There may (probably) isn't one. These are typically routed from the head to the holding tank. Then from the holding tank to a macerator. From the macerator overboard. If the overboard discharge is in the hull below the waterline, there will be a seacock. If it is routed above the waterline (like they did in most 1999 models) there will be no seacock. The Y valve was for a setup where the discharge went from the head either directly to the holding tank or directly overboard. The Y valve would select the destination. That is an old configuration setup not commonly practiced by 1999. Locate the holding tank. 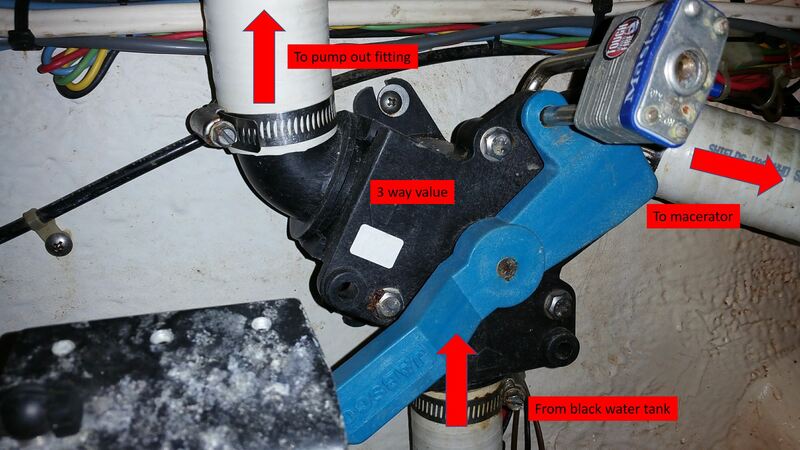 Locate the sanitation lines that are routed from the bottom, or the bottom of the side of the tank. One should routed to the pump-out deck plate. The other should be routed to the macerator. Then follow the line from the macerator to the throughull discharge. I thought it is a coast guard requirement to have a shut off valve to protect from an accidental discharge? It is. That would be the seacock in line at the thru hull. The requirement is that you must simultaneously hold two momentary switches to activate the macerator pump to discharge overboard. 4100 SCA here ... so location might not jive - located right under the pump out deck fitting. Here's what mine looks like. It doesn't 'require' a Y or three-way valve. There are alternative options. If discharged below the hull, then a seacock is sufficient. If discharged above the hull, twin momentary-on switches wired in series can be used. These require that both switches be actively held simultaneously in order to discharge from the macerator. Why the padlock? If it's there to prevent discharge what stops you from removing it if you have the key (I assume you do).